Love A Golden is a rescue organization based in St. Louis, Missouri. We strive to find the best available home for each individual Golden in our program ~ our goal is finding the Golden’s “forever home.” If you are interested in adopting one of our Goldens, we ask that you read more about our adoption procedures by clicking HERE and fill out an adoption application. 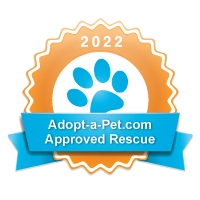 We try to keep our listing up-to-date, but some recently available dogs may not be listed yet and some listed dogs may already be adopted. Click here to learn more about our Senior Life Program. Some of our foster dogs will be at the following events. If you're in the area, please stop by and say "Hi." call 314-669-5955 to reserve a spot over the phone. but the public may not bring their own dogs. Please check the Events for a more complete listing of our upcoming events. 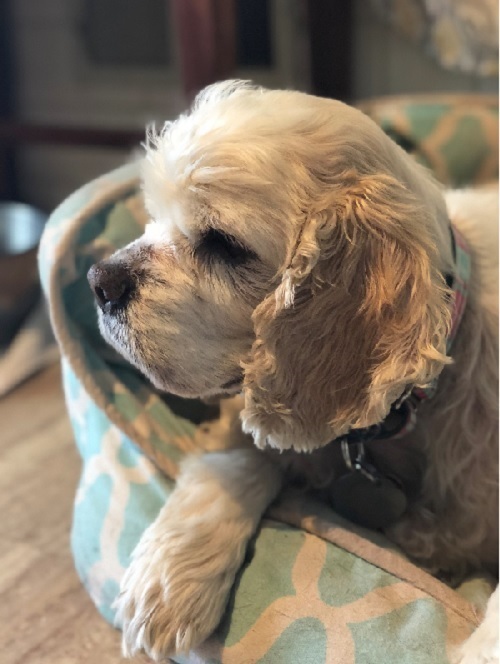 Click on the photos below to get a full size image of the dog as well as additional information and/or photos if available. Nadia came to rescue (and the United States) from Korea. Her early life in Korea is not known to us but some rescued dogs come from the meat trade. We partnered with another Golden Rescue to bring two girls to America who were out of options. Despite Nadia’s questionable early life she is SO sweet, and she’s a pretty confident girl. She is always happy, craves attention, and she loves to be petted and hugged. We think she’s around 2 to 3 years old. Nadia is quite playful. 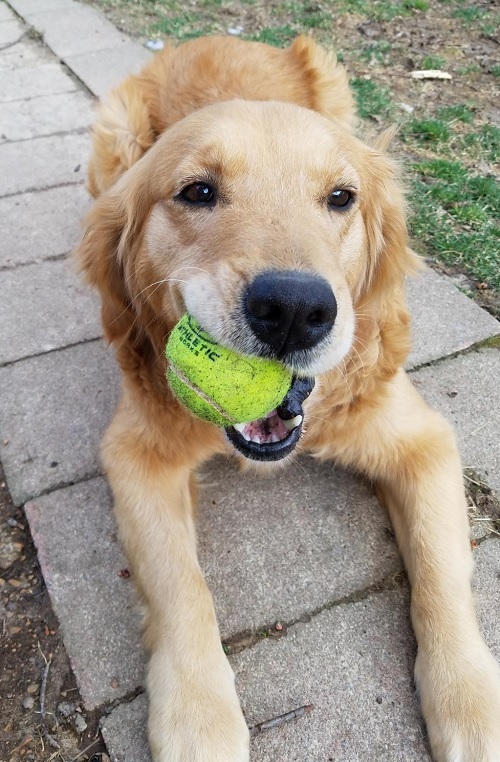 She loves to roughhouse with the other goldens in her foster home, and she will actually bring a ball back if you throw it! People, we have a real retriever here!! She’s short and squat, but that doesn’t keep her from counter/table-surfing. She’d like to go to obedience class with her new forever family, and she would also like to live with another dog and/or have some kids to play with. As a dog from overseas her adoption fee is higher than dogs rescued in America. Click on Nadia's picture to go to her own page. Kellogg, aka Coco, is just over a year old. 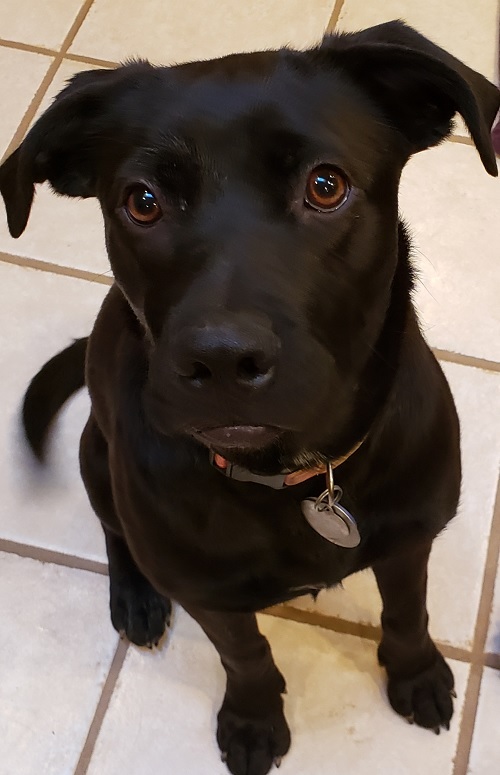 She is a Black/Brown Lab mix. She is very small for a lab and currently weighs about 42 lbs. She is a very sweet little girl. She loves to play with her foster brothers and LOVES the water. She a very laid back dog and very calm for her age. She is a HUGE snuggle bug. She walks very well on a leash and is a fast learner and has already started learning some tricks. She doesn't like her crate very much and doesn't like to be alone. She's great around kids and would do well with other dogs in the house. Click on Kellogg's picture to go to her own page. Mutz (pronounced Mootz) is a darling young mix who ended up in rescue after finding himself homeless. A mix of what, you ask? Really, whatever you want him to be. He might be the rare “wee cutie-patootie antelope runner” (because he leaps when he runs). He’s got a super soft coat, and cute Flying Nun ears. He’s a great size – a little under 50 pounds. We think he’s about a year old, so he won’t get much bigger. He is happy, snuggly and playful. Mutz is treat motivated, and a quick learner, and he’s very good about coming when called. He is kennel trained, and is “mostly” potty trained. (His foster home is working on it. He’s only been in rescue for a week.) 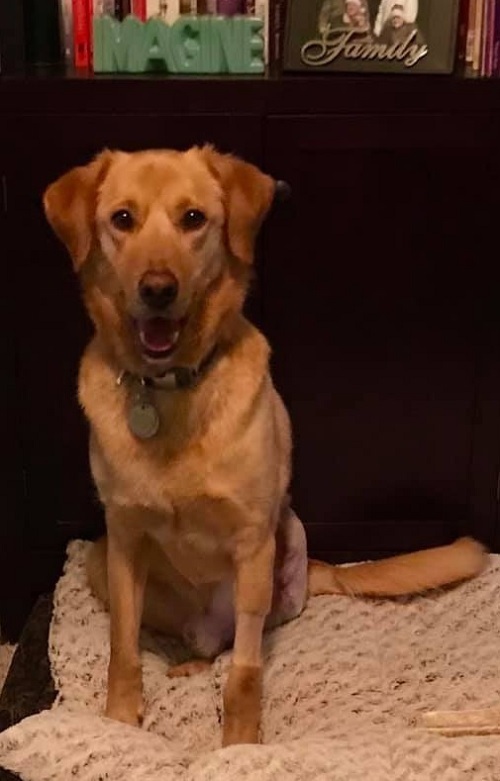 Mutz plays nonstop with the other goldens in his foster home, and when he’s tired he is content to lay on the floor with a Nylabone or cuddle on the couch. He would be pretty happy to have another playful dog or kids in his forever home. Click on Mutz's picture to go to his own page. Bullet is a silly, loving Tripod probably 18 months. He was sadly shot (hence his name) in his rear knee causing a lot of pain, but his loss of a leg in no way hinders him. He loves to be close by and is very playful. He prefers human interaction over dog play but is not dog adverse. He would love a home where he gets quality time close to his human and lots of rides in the car. He describes himself as an escape artist, so a 6-foot fence would be beneficial. He thinks things are always greener the other side of fence! Click on Bullet's picture to go to his own page. 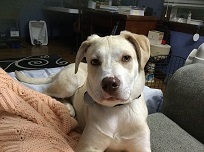 Parker is a 6-month old yellow lab mix estimated born in August 2018, who is such a sweetie! He has a lot of puppy energy, but is a gentle boy. He plays with other dogs easily and respectfully. He is food-motivated and will sit, shake and lay down if there are treats handy. He was malnourished when he was found, but is steadily gaining weight. Parker has a “puppy” curiosity, but is easily redirected to investigate things that are safe for him. Parker needs a family who will take the time/patience to train and exercise him. He is pretty well house-trained but has occasional accidents. He does very well in his crate when alone in the house or at night. He likes to climb up on laps for cuddles and has loads of love to share! Click on Parker's picture to go to his own page. 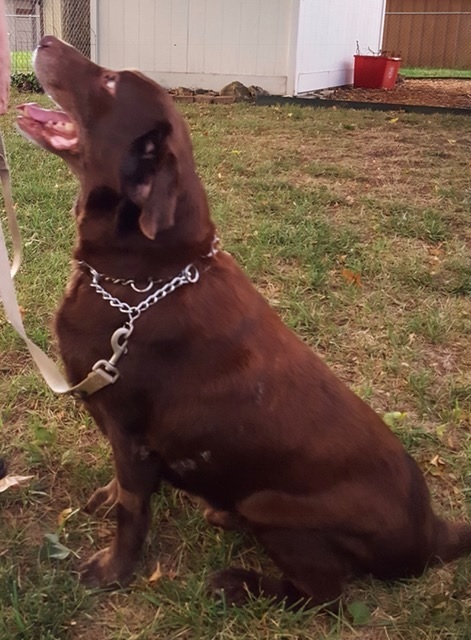 Bruce is an 8 yr. old chocolate lab who is looking for a forever home. He loves to play and run in the yard. He loves balls and toys. He is a handsome boy.! He has learned that riding in a car is not a bad thing and can now relax while he rides. He needs practice walking on a leash. 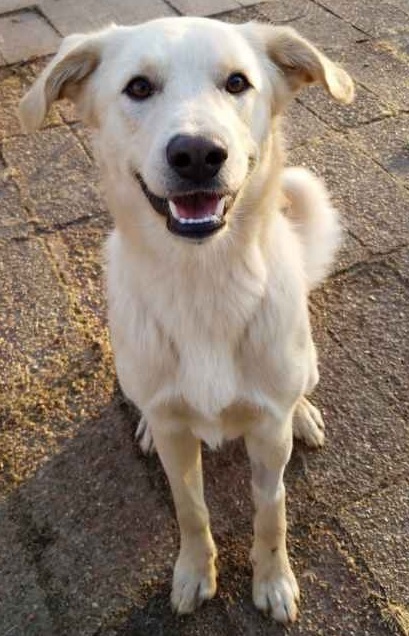 He will do best in a home as the only dog, he loves attention and he enjoys meeting people. He is quite a tail wagger! Due to his aging hips he will need a home with minimal stairs. Click on Bruce's picture to go to his own page. Cammie was noticed wandering around with her head hanging low in a fenced in run behind a local vet office. Her owner had passed away, which had left Cammie homeless. She is 15 years old. Cammie suffers from being quite a bit overweight, has a mammary tumor, low kidney function, a tumor on her right eye and general lack of mobility. Our idea was that we could turn her around a bit so that she could ride off into the sunset with some doggy dignity. We took Cammie in because we enjoy giving quality end of life care for seniors. Since taking her in, she has lost several pounds on a new diet, recovered some of her eyesight with the use of some medicated eye drops and has become a lot more mobile. She already has a much higher quality of life. Cammie would love to have a foster buddy or two to help with her eye medicine. We know she isn’t a golden, but she sure has a golden heart and spirit! Click on Cammie's picture to go to her own page.